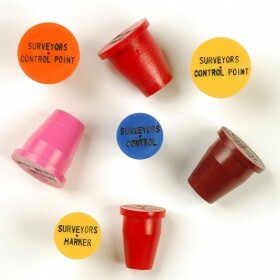 SURV-KAP plastic Survey Markers are designed to provide permanent identification for your surveys. SURV-KAP plastic Survey Markers are easy to install and can be personalized with your individual information at no additional charge. Priced in quantities of 100. Minimum order of 200 (qty of 2) of the same size, color and stamping. 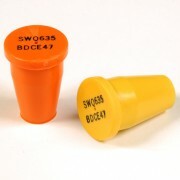 If plain caps are needed, please call our Customer Service Team with your requirements.